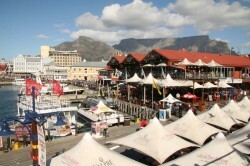 Cape Town, the ‘Mother City’ of South Africa, was voted the best tourist destination for 2011 by Tripadvisor. 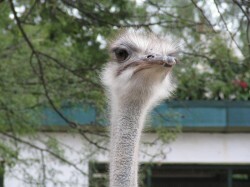 Oudtshoorn, the ostrich capital of the world, with the renowned Cango Caves and the world’s largest stalagmites. The Garden Route, is a strip of land like no other in the world in terms of beauty, natural attractions and unique fauna and flora. South Africa has it all! DAY 1: History of CT, pick up at Cape Town International airport mid-morning, start where it all began – Castle of Good Hope – the first building in CT, lunch, onto Robben Island and the impact of Nelson Mandela- how one person can make a difference. Off to 3 – 4 star accommodation to drop off luggage and freshen up via the Bokaap, an area of colourful flat-roofed houses with an equally colourful history, then to the Waterfront for supper and to wander round the shops soaking up the sights and sounds of the Mother City. 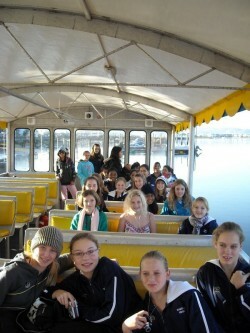 DAY 2: Peninsula tour of Cape Town, Up Table Mountain for a view of the city and peninsula (weather permitting). Boulders Beach to view the African penguin colony, swimming in the sea and lunch, hopefully see baboons en route to Cape Point Nature Reserve, climb to the top to the most SW point of SA, drive along the scenic Chapman’s Peak and end the day at Clifton beach for late afternoon Frisbee throwing and a sunset picnic on the beach. View the city lights from Signal Hill before returning to hotel. 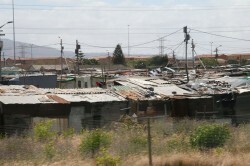 DAY 3: Cape Town Township tour and outreach, visit the poverty stricken ‘Townships’ of Cape Town. Start off with District Six and hear the stories of those who used to live there before they were forced to move under ‘The Group Areas Act’. Experience Township life, visit schools and pre-schools in this disadvantaged community, helping children with reading and communicating with them, sharing cultures. This tour includes visits to monuments built in honour of students who died in the struggle against apartheid, visits to Tsoga, an environmental and recycling centre, Guga S’Thebe, an arts and crafts market, Eziko catering school and restaurant in Langa. Experience traditional food for supper. DAY 4: The ‘Big 5’ game drive: just 2 hours from cape Town – visit a private game reserve. Guided game drive in special game-viewing vehicles to spot elephant, rhino, buffalo, lion, leopard and more of the mammals that make up African wildlife. Visit the Animal Rescue Centre, lunch under the boma and swimming in the pool under Africa sun. After leaving the game reserve, finish off the afternoon at Cool Runnings for tobogganing (the summer version- on steel not snow), 1.25km of twists and turns at 40km/h thrills. DAY 5: Bus ride along scenic Route 62 through the Karoo to Oudtshoorn: visit the spectacular Cango Caves for the exhilarating Adventure Tour, to learn about stalactites and stalagmites, next onto a working ostrich farm which includes riding an ostrich. 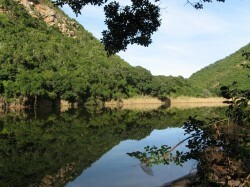 DAY 6: Oudtshoorn to Knysna: visit the Cango Wildlife Ranch to study crocs, the ‘Big Cats’ and more. Travel to Knysna Elephant National Park to learn about these gentle giants, conservation and have an opportunity to touch and feed them. Visit Knysna’s Waterfront for shopping and supper. DAY 7: Plettenberg Bay and beyond: visit Monkeyland, the biggest primate sanctuary in Southern Africa, walk the highest suspension bridge in Southern Africa, marvel at the exotic Birds of Eden and learn about the rehabilitation of raptors. 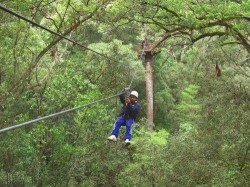 Experience the exhilarating Tree Canopy Tour in the Tsitsikamma forest by riding through the indigenous tree tops 30m above the ground. Late afternoon visit to Plettenberg Bay beach followed by supper at one of South Africa’s favourite steak houses. DAY 8: Knysna Fauna and Flora : a ferry ride to Featherbed Nature Reserve at the Knysna heads including a fauna and flora study, a short hike and lunch. Next visit the Knysna Oyster Company to learn about this unusual industry and have an opportunity to taste an oyster. Late afternoon obstacle course through the indigenous forest, Tjembe drumming workshop, a traditional South African braai for supper followed by a walk through the indigenous forest at night studying the nocturnal animals that live there. Time for some solitude and reflection. DAY 9: The Wilderness for tranquillity and extreme sports: canoeing 2,5km into the Wilderness Nature Reserve, hiking through indigenous forest to a waterfall and a chance to swim in the invigorating river pools, afternoon of abseiling and team building activities. Once again late afternoon spent on the white sands of the beach with the wind and the waves in your hair. DAY 10: Back to Cape Town : After breakfast, pack up and depart by bus for Cape Town to be dropped off at Cape Town international Airport for connecting flight back home taking with you laughter, a suntan, African curios, an improved attitude and values, photos and memories for a life time. Learn what it was like in early Cape Town when it was just a colony. Identify the role of Nelson Mandela and the ‘power of one’. Study the diverse fauna and flora of Cape Town, Karoo, Garden Route and oceans. Gives children an opportunity to see the “Big 5′ in their natural environment and the need for conservation. Give inland children an opportunity to enjoy the coast, sea and beaches. Explore the indigenous forest during the day and at night. Allow for reflection and personal development. Allow the children to manage themselves as ambassadors for their country. Julie Womack is a qualified South African school teacher with 29 years teaching experience. She has organised and taken part in more than 12 school tours along the Garden Route, Cape Town and to Kruger National Park. She is offering her services to help you with your Outdoor Education Programme. She is also available to go with you on the tour and do the tour guiding and managing. Costs : The cost will depend on the number of children and adults. The cost will include all bookings, all meals, 3 – 4 star shared accommodation, entrance fees, guiding fees at the different venues, luxury coach with seatbelts, driver’s costs, pro rata costs of the teachers, full time All Africa Tours guide and master copies of all the worksheets. The price will exclude flights to Cape Town, travel and medical insurances, visas, tips and gratuities. 4. The worksheets need to be rolled off by the school at least 10 days before the trip as they include the final itinerary and a list informing the children what to bring on the tour. These will be emailed to you a month before the tour begins. 5. Ever child’s parents will be required to fill in an indemnity form and an emergency form with contact details. This will be emailed to you a month in advance. 6. The school needs to supply a comprehensive First Aid kit to accompany the children on tour and to have obtained written permission from the parents for the teachers to administer non- prescriptive medicines. A list of recommended medicines is available. 7. This tour is in a Malaria free area so no prophylaxes are needed. 8. If Julie is required to accompany the trip, the teachers are to take full responsibility for the behaviour of the children especially at night. 9. There is a 25% deposit upon confirmation to secure all bookings and the rest of the payment 31 days before departure.